The Flying Aces entertainment programs are informative and humorous but their obvious attraction is the spectacular athletic skills displayed by our performers. Your audience will be delighted and amazed at what they see. "Kids of all ages" love our programs, from preschool age children to teens and even adults. 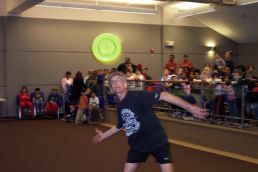 The shows end with an audience participation contest where teams of two compete for autographed Flying Aces Frisbees.